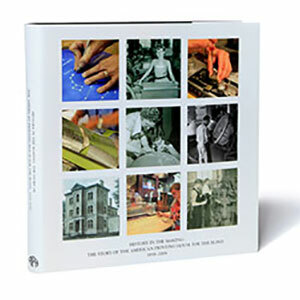 A beautifully illustrated history book about the American Printing House for the Blind (APH), the world's largest company devoted solely to researching, developing, and manufacturing products for people who are blind or visually impaired. It is the first book published exclusively on the history of this unique Louisville, Kentucky company, the oldest organization of its kind in the United States. Written by former APH Museum director Carol Brenner Tobe of Floyds Knobs, Indiana, the book was commissioned to celebrate the company's 150th anniversary. Hundreds of rare detailed illustrations and historic photography about the origins of APH fill this 180-page book, including rich, full-color photography, tactile pages from vintage books embossed on original APH presses using original plates from as early as the 1880s, and an accessible MP3 audio book. The book was designed and art-directed by internationally known graphic designer and fine artist Julius Friedman, with photography by Geoffrey Carr. Old Stone Press founder John Clark was the production manager on the project, coordinating print and bindery production with the late Bill Butler of Butler Books of Louisville, Kentucky. As an organization with a 150-year history of accessible product innovation and human service faced with the daunting task of publishing our own story and 'getting it right,' we turned to John Clark, our long-time friend and print manufacturing consultant, to help us focus and stay on task. John managed the entire process, from securing the designer, coordinating with our manuscript writers, and contracting with the book publisher, to managing the print production in China. The result was a multi-award winning book that was delivered on time. We highly recommend John Clark and Old Stone Press. We are proud to have and share their beautiful and creative vision of our journey.